FEC Heliports is pleased to now offer the newest and most versatile LED Heliport Beacon on the market today. This high visability LED beacon is completely programmable and can be set to (4) different levels of intensity. Programming is simple and straight forward with the use of internal switch boards. You can program the beacon for a variety of flash rates and this unit will even provide the simulation of rotating. 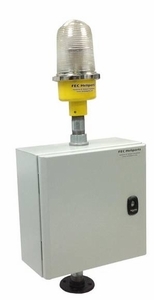 All of FEC's beacons are made of the highest quality components and can be installed in any environment with an operating temperature from -25C to +50C.